I have been appointed to fill the President’s position for the term that will end in November 2015. 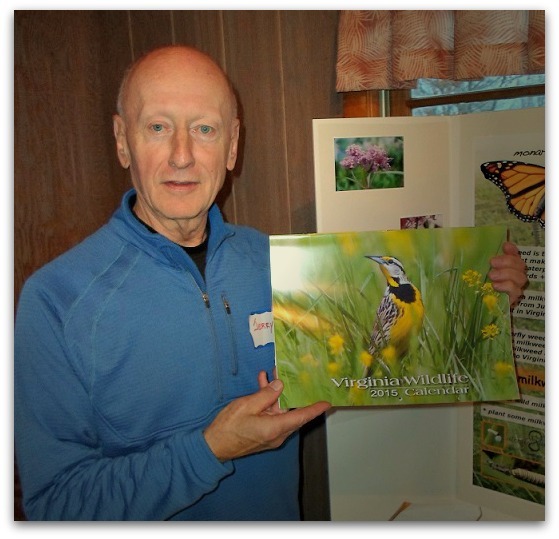 I have met with many of the members since the appointment to get me ‘in the curve.’ I said at the Annual Meeting and will repeat it here, I marvel at the talent of the members of Headwaters Chapter of Virginia Master Naturalist. Each of you have your brand of experience and education that you bring to the Chapter. And it all comes together to make the Chapter a wonderful experience of Nature. The Chapter had 50% of its members in attendance at the Annual Meeting, Saturday, Nov. 1. Chapter members Gail Napora and Chris Bowlen gave a fantastic program on the 2015 Focus Project of Monarchs and More. There are four garden teams now formed but there is room for more Naturalists to participate. If you are interested in helping [designing, planting, watering, monitoring, etc. ], please contact Chris or Gail. We then had David Mellor, the Citizen Science Coordinator for Virginia Master Naturalists, give a presentation on Adaptive Management and Collaborative Science. He explained the use of technology to help individuals in their stewardship projects. You can go to the website of CollaborativeScience.org for more information. We then broke for dinner. What a feast! If you left hungry, it was your own fault. After dinner it was the wonderful presentation by Chip Brown on Night Skies concluding with a walk into the open fields to view the moon and stars. There is no light pollution at Buck Hill Farm. You can see the Night Skies without worry of interfering lights. Many thanks to all who worked so hard to make the Annual Meeting the success it was. We want to reflect on the Chapter’s past year and the success of Headwaters. We had many projects that benefited from the large number of volunteer hours. Water monitoring on the Middle River and the 2014 Focus Project, headed by Kate Guenther, at the Wildlife Center were probably two of the projects that included the most members collectively. But all of you participated in many individual projects in addition to the two major ones that have helped many agencies and parks. Without your participation the Chapter would not have been as successful as it was nor would the improvements made in nature have been as great. You have made a difference in the natural world. We now use that success to build on the next year. Thank you to each of you! And, now, to the title of this article, “Oysters ‘R’ in. . .” In days before mechanical refrigeration, oysters did not keep well unless it was cold enough for them to be shipped to markets. People devised the “‘R’ is in” to know the oysters were safe to eat if purchased in months that ended in ‘R.’ The ‘R’ is in is a play on the letter ‘R.’ It relates to Headwaters in that we need each of you to Recruit trainees for the Spring 2015 training class. Trainees are the life blood of the organization. We have members leave for various reasons in their lives and we need new members to be able to continue the legacy that has been established. RoxAnna and the Training Committee have made several changes to the Training Program that will start in the Spring. Training had been starting in the fall but this session will start in the Spring where classes and field trips will take on a new meaning with the warmer weather. But we need your help. In your journey through the natural world you come in contact with many people. Some of these people may be perfect candidates for the Headwaters Master Naturalist program. 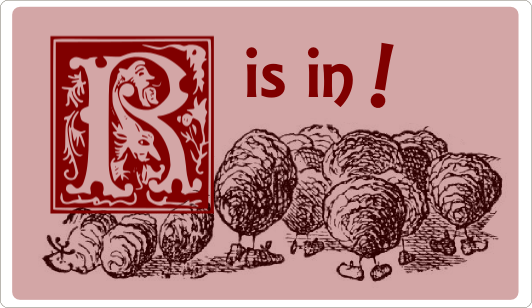 Please remember that ‘R’ is in and start Recruiting now. These trainees will thank you for introducing them to Master Naturalist just as you remember and thank the person who recruited you. Recruiting is in! Please help. November 5, 2014 in Chapter Business.